And sometimes oftener, & we are often enabled to rejoice on account of the presence of God in our midst. I attended today the funeral sermond of Miss Dolie Hays preached (by the Rev. Cronelius) in the Barnesville M. E. Church. Blessed are the dead that die in the Lord. I remained at my father's untill April the 4th at which time I commenced teaching School at Delashmuts School house (known by the name of Locust Grove School) & have been teaching untill this date & intend to continue untill April the 4th 1860 the Lord willing. Our meetings have been kept up pretty well untill harvest at which time they were stopped except on Sabbath. 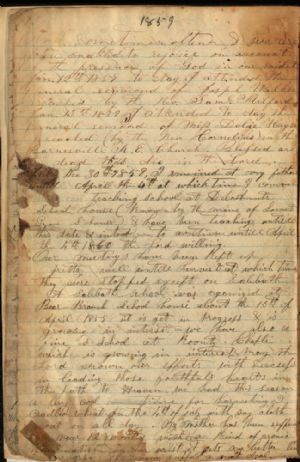 A Sabbath School was organized at Bear Branch School house about the 10th of April 1859. It is yet in progress & is growing in interest- we have also a fine S-School at Koontz Chaple which is growing in interest. May the Lord crown our efforts with sucsess in leading those youthfull hearts in the path to Heaven. We had this season a very cool time for harvesting, I cradled wheat on the 4th of July with my cloth coat on all day. My Mother has been suffering for near 12 months with a kind of cronic rheumatism in her wrist. It gets no better [?] worse. She now suffers a great deal.